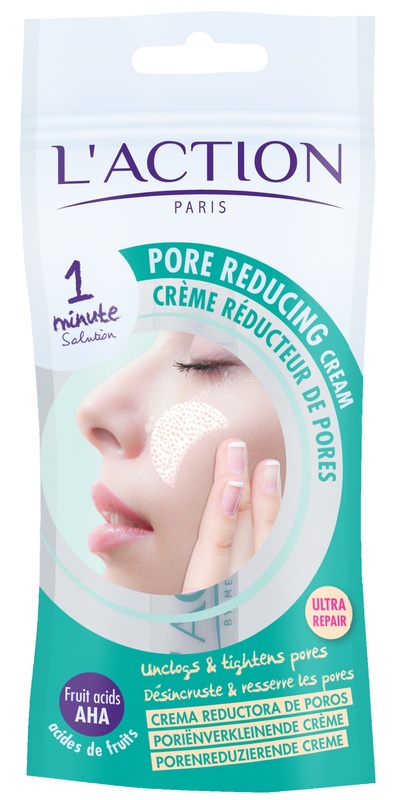 L'action Paris 1 min Solution Pore Reducing Cream is specifically designed to reduce the common concern of clogged pores. The product reduces the size of the pore whilst shrinking the surrounding red area, leaving you with a smoother, finer and refined texture. A perfect primer to use before applying make up, the cream is dispensed from a handy little pump making application neat and simple. Composed of Pineapple, Passion Fruit and Raisin extracts, the cream is naturally beautifully scented making application a real pleasure! Suitable for all skin types. Your pores are tightened and your skin texture is beautifully refined. Excess sebum (oil) is absorbed and your skin is hydrated with elasticity improved, leaving your skin feeling beautiful and smooth. Massage the cream in every morning until fully absorbed and follow with your usual make-up. It couldn’t be more simple!